What a weekend! Doesn’t it feel great when something you’ve been working so hard toward finally comes to fruition? And doesn’t it feel even greater when a multitude of people were there with you, supporting you, enjoying it with you, and helping you through every step of the process? Well, we sure are grateful for every single person who helped make the 22nd Corndog Kickoff a wonderful success! With about 2,000 attendees, more than 100 night-of volunteers, over 20 food vendors, and countless behind-the-scenes donors, volunteers, and staff, we enjoyed a night full of fabulous foods, lively entertainment, and all sorts of fun! The Blue Ribbon Foundation is humbled to announce that this year’s Kickoff has raised a total of $542,000, raising the event’s grand total to over $6.2 million—all of which goes toward preserving and renovating our Iowa State Fairgrounds! Without all of the generous donations, support, and time given from those people listed above, none of this would be possible. • A total of 250 Silent Auction packages and 34 Live Auction packages filled the VI Building on Saturday. Check out a few of them below! • The Fair foods were flying off of the tables and into the hands of hungry guests faster than ever before this year! Some of the popular items included: Corndogs, Pork Chops On-A-Stick, Kettle Corn, Smoked Brisket & Bacon Mac N’ Cheese, and much more. Liked what you tasted? Enjoy them and much more at the Fair in one month! • New merchandise items were also very popular at the Kickoff, such as the 19th Edition Cookbook with recipes from the 2016 and 2017 Iowa State Fairs. You can order yours at our online State Fair Store. • For only a $100 raffle ticket, the lucky winner of our Winner’s Choice Raffle chose the Farm to Fair Table Live Auction item as a prize—what a deal! 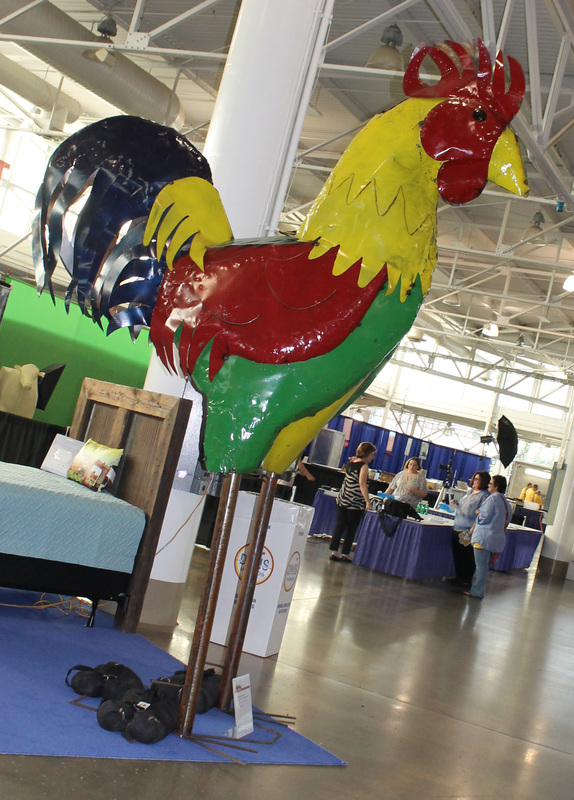 • The auction item everyone was curious about…our 12 foot tall metal rooster did find a home Saturday night. Though he won’t be waking up any nearby neighbors with his crow, he is sure to bring a pop of color amongst his new wildlife friends. Mr. Rooster, you will be missed. • A dazzling fireworks display lit up the night sky after the completion of the Live Auction. What a perfect view this would have been while relaxing at the top of the Sky Glider! Stay tuned for more pictures and news from Saturday night. Thank you again to all of those who made this year our best Kickoff yet!